Color has the incredible ability to influence your memory, mood, perception, likes and dislikes. This is why I use color as a tool to help my clients with organization or planning their next event. 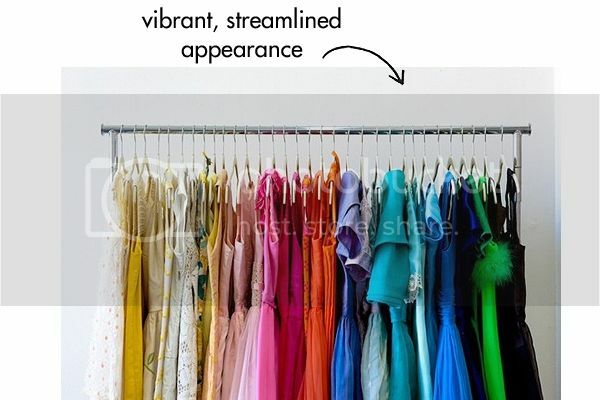 When it comes to closets, the reasoning is that it is easier to find something to wear when you know what you own and exactly where to find it. This is especially helpful when your closets are the size of mine. In one of my unfortunately small closets I keep my tops and dresses. Each color grouping has sleeveless, short sleeve, long sleeve and dresses, in that order. So when I want to wear something, I know exactly where to look. You should definitely try it. You might even be able to do a little shopping with all the time you save not looking for your favorite shirt. 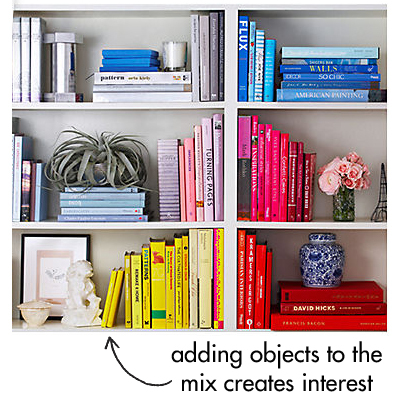 Sometimes color coordinating is more about giving your space a lift, instead of getting organized. A perfect example of this would be books, though this is definitely not for everyone. Having lost almost 1000 sq. ft in the move to Nashville, my books are now displayed throughout the house instead of in a large built-in bookcase. Keeping things together based on author, title or subject matter is just not realistic anymore. My solution was to make a visual statement by arranging them in color groups. Add in a few found objects and mementos and you have a conversation piece. No need to sweat the fact that you may not remember Roy G. Biv from elementary school. The point is to use color to shatter monotony, and instead showcase a space with playful personality. There are no rules - create a rainbow of color that works for you.